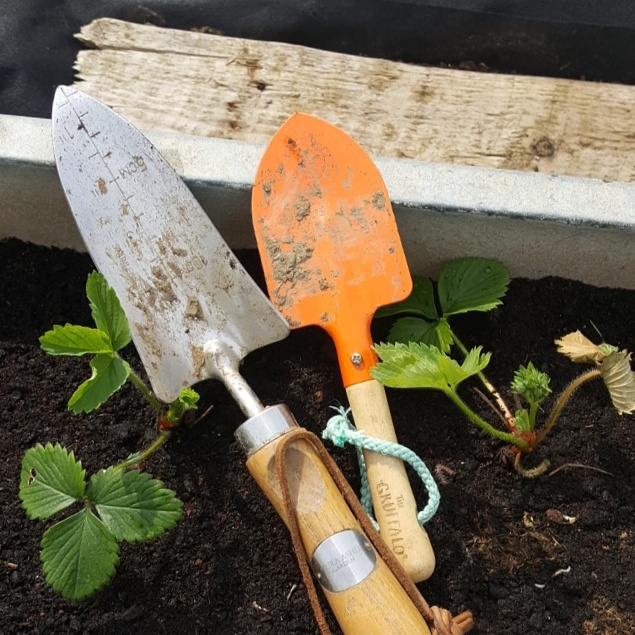 This is such a busy time on the allotment, so many things changing really quickly and so many jobs to do! We’ve had a few days there this month as well as growing plants at home, and the chickens now live there too! Last Sunday we moved them, and noticed one wasn’t looking too well. We’ve been visiting a lot to check on her and a kind allotment neighbour gave us some chicken tonic to put in her water. (We’ve ordered some more but what we’ve given them should last until ours arrives.) Hopefully she will perk up a bit soon. 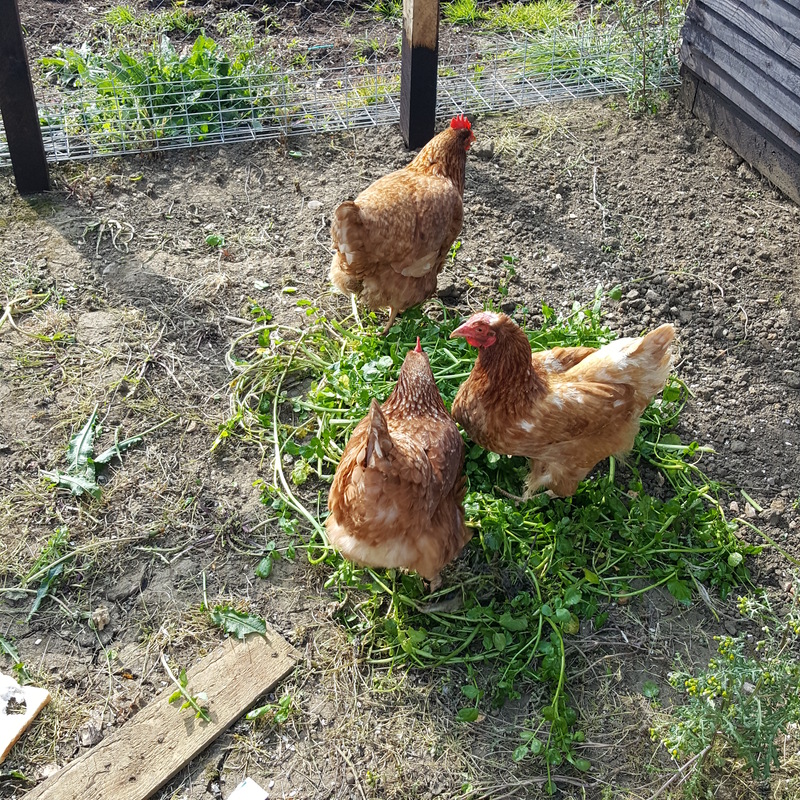 They love the weeds there, and we throw a couple in every now and then as they’ve cleared the ground in their run. On the growing front, things are moving fast. 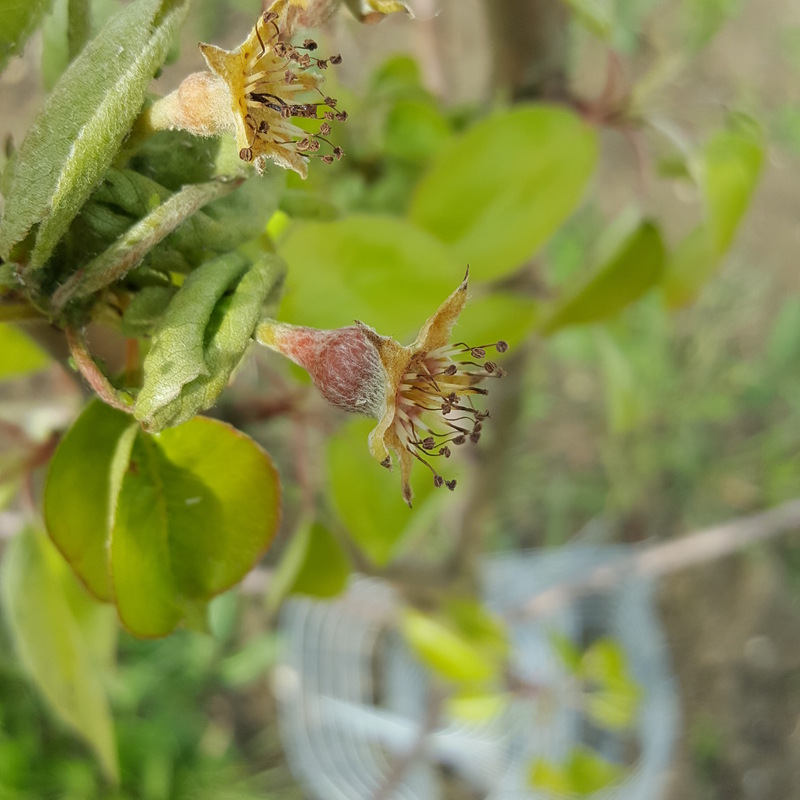 The redcurrant bush is laden with fruit, and the fruit trees (well, some of them) have blossomed and it looks like we have a few potential pears. We’ve planted a row of onion sets now, although we need to get some more white onions. 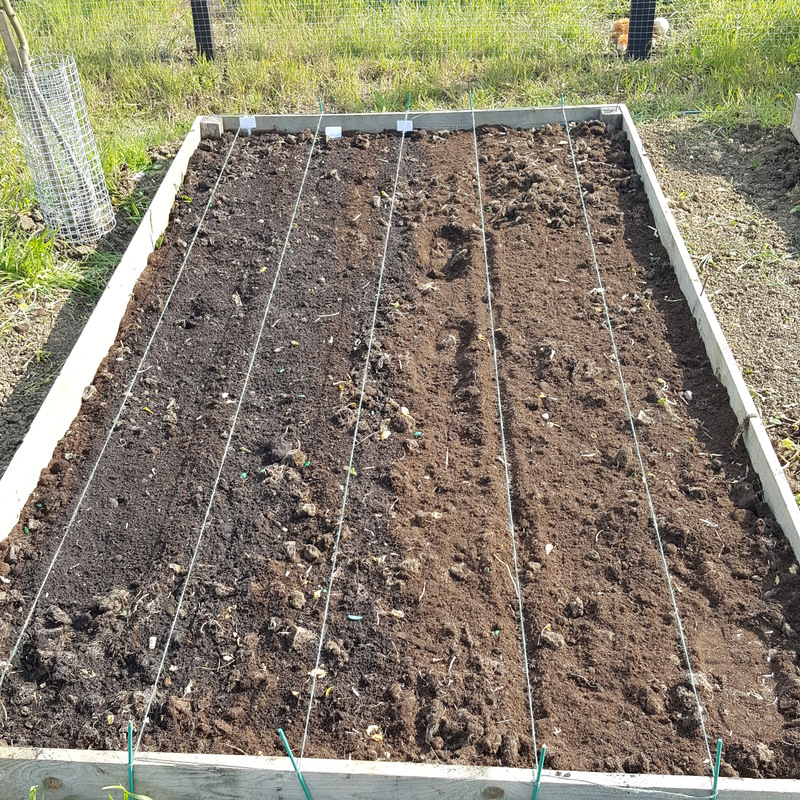 We’ve also used a bit more precision when planting the raised beds and put lines along them to mark rows of seeds. I feel like a proper grown up now after last year’s ‘chuck some seeds in and hope’ approach. We’ve sown beetroot, parsnips and two types of carrot directly into the soil. When I was planting yesterday it was really noticeable that the soil was warm to the touch. It definitely feels like a good time to be planting! The allotments are always busy at the moment; the only time I had to unlock was when I went on Tuesday in the daytime. As we move into May there are yet more beds to be planted, and a second sowing of carrots, beetroot and parsnips. The area where the chicken coop was in our garden is being dug out, and the manure/straw/bark chippings will be added to the allotment. The plastic greenhouse is full of tomatoes, beans and aubergines, as well as courgettes, pumpkins and some newly sown butternut squash. Luckily the greenhouse protected them from the overnight frosts we’ve had this week. How is your growing going? Have your plants survived the recent chilly nights? What other jobs are you trying to get done in the garden? Previous Post Patterns-To Pay or Not to Pay? I’m just enjoying seeing what’s coming up in our new garden. We’ve been here 6 months now and there are still lots of new things popping up. I’m also trying to keep the self-set seedlings from all the big trees around us under control. Hubby planted a random selection of veg seeds a while back but we’re a bit half-hearted about tending them. Sounds like things are coming along nicely. And your crop list sounds more diverse, I think, than last year? Maybe I am wrong in that. But anyway, it looks like you are set to do really well. We are planning to sow some grass seed to patch some bare places on our lawn. We are moving into cooler weather but still warm enough to germinate the seed. Our pumpkins are maturing and the cauliflowers are slowly growing. I don’t think our passionfruit are going to fully ripen as the days are not warm enough. We will just have to wait and see. I am just happy that the vine produced fruit at last. Maybe next year we will get fully ripened fruit on it. All sounds like it’s going well! I’m hoping we will see our pumpkins through to maturing. Thank you, we have added a few crops to the list for this year. Strawberries are new (at the request of the children! ), as are pumpkins and parsnips. Let’s hope we can keep them all alive! I have never had a parsnip-but plan to find some and try. Oregano can be pit in the water for your chickens and is a natural antibiotic. Best wishes! Your raised bed looks wonderful! We have only got our potatoes planted. They kept telling us we were going to still get some snow this weekend so I have been holding off planting anything more. We had a hard freeze a couple nights ago so patience is the word……for now. Oh no! Hope it warms up soon. We’ve had light frosts this week which killed off the cherry blossoms. The courgettes and so on are staying here until mid to late may, which is our usual last frost date. Thank you, I’m hoping that most of the plants will grow well. Some of them are new to us so who knows if they’ll work or not! We can only try. All sounds really great. Don’t lose hope with the parsnips if they are a bit slow. I sowed some undercover on march 4th and they only came up this weekend. Not seen my outside ones yet but I think that’s normal. Thank you, I heard they were slow growers so planted alternate rows of parsnips and carrots. I’ll stay patient, and hope the birds haven’t eaten my seeds! Gary and I have always wanted to grow our own stuff but we don’t ever have enough spare time to do it justice. You’re doing brilliantly! Thank you. 😊 I bet the children would be awesome at helping you if you get a chance to try. You certainly are busy, MrsCraft! Your allotment is looking very good indeed – and fingers crossed for your pears. Thank you, we found not much grew until later in May last year so don’t give up hope! My track record with plants is pretty rubbish too. Everything sounds amazing … apart from the sick chicken. Hope she improves really soon. If she’s still looking a little under the weather, maybe a trip to the vet would be in order. Chickens can be such a worry when they get ill. You get no warning … suddenly *gone*. We lost my favourite chicken about 18 months ago. She seemed fine and groovy, in the morning when we let all the chickens out to have a bit of a scratch and run around, then when Mr.Cobs went to take them some sweetcorn about two hours later, she’d passed. I thought Mr.C was telling me some sort of sick joke when he came in the house and told me. Very good luck with your veg. I’m a little bit envious as I don’t think we’ll have chance to grow our own this year as we have too much going on. But … I just want Mr.C to even just grow some courgettes. They’re one of my faves. and used so much in all sorts of recipes which we love. We had a huge garden at our old cottage, but when we moved 200 miles to live in the South of England, we had to ‘give’ on some requirements and one of those was a large garden. The gardens we’ve inherited are very much smaller and had all been (decoratively) paved over in one form or another and because of this we’ve been slowly changing the gardens so that they work for us. Mr.Cobs had three huge vegetable beds at our old cottage and we grew everything that could be grown. From garlic to potatoes; carrots; different sorts of lettuce; courgettes; sprouts; cucumbers, radish, peas, cabbage, sweetcorn, … oh all sorts! The only thing we didn’t really have great success with was tomatoes. We could grow them … but not abundantly. Courgettes however … oh. my. GOODNESS!!! We could supply all the neighbourhood with those. (and we did). lol. Aww Mrs.C …. that just got a rather headachey Tuesday morning turned around and brightened my day. Haha, thank you, I definitely don’t get a chance to get bored!